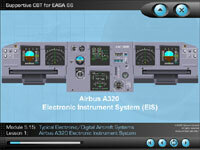 Sphaeras Airbus A320 CBT for EFIS and ECAM delivers approx 25 minutes of student self-paced training. It features narration, interactivity, embedded questions and remedial branching that covers the A320 EFIS and ECAM. It is also suitable for the A319 and A321. Lesson 1: Airbus A320 Electronic Instrument System: The first lesson introduces you to the electronic instrument layout from the Airbus A320. You will receive an overview of the EFIS and the ECAM and learn the names of the displays. Lesson 2: Airbus A320 EFIS: In lesson 2, you take a closer look at the Primary Flight Displays (PFD) and Navigational Displays (ND). 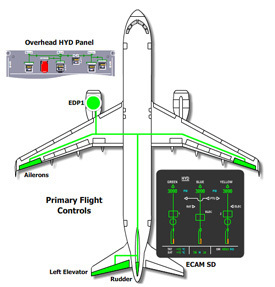 Lesson 3: Airbus A320 ECAM: Lesson 3 provides a closer look at the Engine/Warning Display (E/WD) and the System/Status Display (SD). Student aerospace engineers: The CBT provides excellent supportive information for students studying EASA Part 66 (formerly JAR 66) module 5 (typical electronic / digital aircraft systems) providing a real-world example of the EFIS and ECAM systems from a popular modern commercial aircraft. 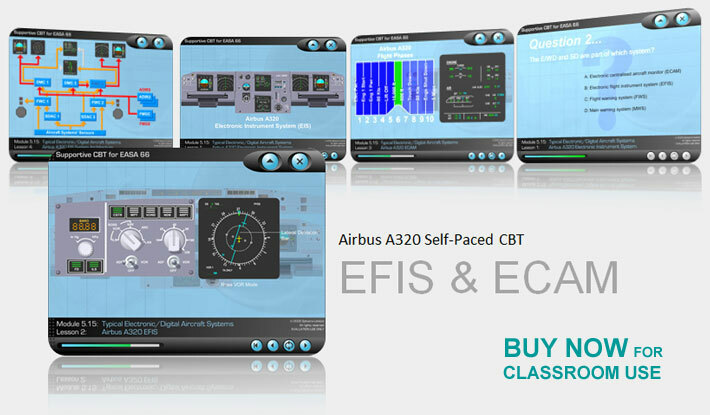 Pilots: The CBT provides a useful overview and familiarisation of the A320 EFIS and ECAM systems. Aviation enthusiasts: For those simply wanting to learn more about how modern airliners operate, the CBT is ideal. Instructors: The CBT can be used within aviation training colleges or groundschools. You can purchase this product for instructional use by visiting our products list or, for more information, contact us. 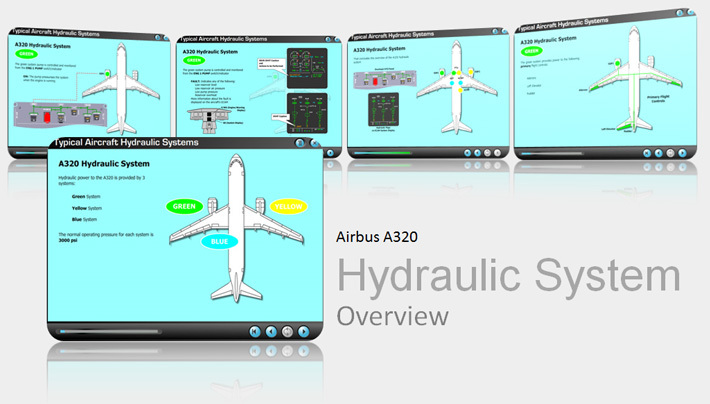 Our A320 hydraulic system overview is suitable for instructor-led classroom delivery or as part of an online eLearning package. It features sharp, clear and colourful images to describe the purpose and function of the green, yellow and blue hydraulic systems together with their associated cockpit controls and indications. This training material provides an overview of the A320 hydraulic system at a high enough level to be useful to both flight crew and student maintenance engineers. Through a series of 46 clear and easy to understand images students will quickly acquire all the essential knowledge to describe the purpose and function of the green, yellow and blue hydraulic systems, their normal sources of power, back-up supplies, distribution and their associated cockpit controls and indications. This training material is aimed at aviation training colleges teaching EASA Part 66 Modules 11 or 13 who wish to provide students with a clear and easy to understand overview of a typical hydraulic system from a popular commercial aircraft. The material may also be suitable for A320 operators as a high-level overview for flight crew, but is not detailed enough for recurrent training or for type rating. However, we are happy to work with interested aircraft operators to extend and contextualise the content to suit any specific requirements.